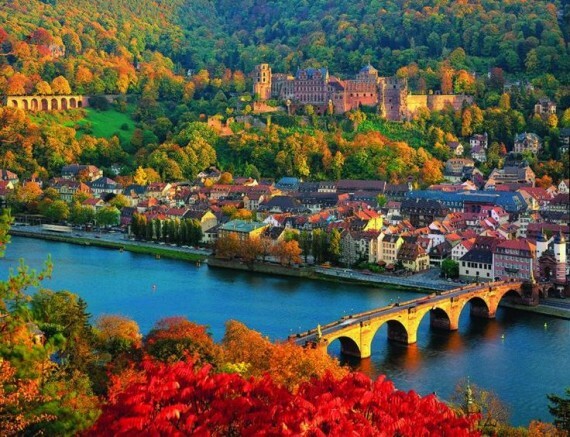 Heidelberg is a city situated on the river Neckar in south-west Germany. 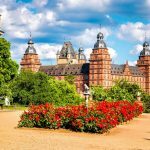 The fifth-largest town in the State of Baden-Württemberg after Stuttgart, Karlsruhe, Mannheim and Freiburg im Breisgau, Heidelberg is part of the densely populated Rhine-Neckar Metropolitan Region. 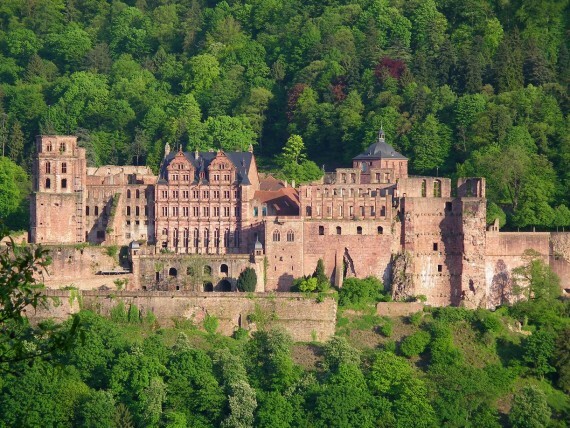 Heidelberg castle is a mix of styles from Gothic to Renaissance. 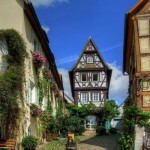 Prince Elector Ruprecht III (1398–1410) erected the first building in the inner courtyard as a royal residence. 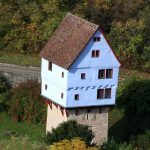 The building was divided into a ground floor made of stone and framework upper levels. 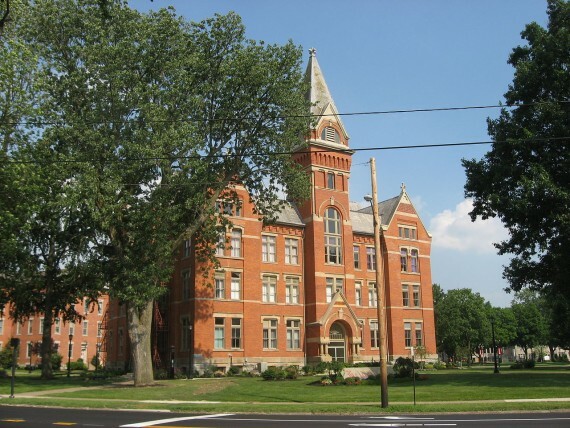 Another royal building is located opposite the Ruprecht Building: the Fountain Hall. Prince Elector Philipp (1476–1508) is said to have arranged the transfer of the hall’s columns from a decayed palace of Charlemagne from Ingelheim to Heidelberg. 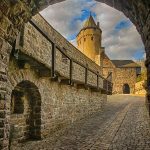 In the 16th and 17th centuries, the Prince Electors added two palace buildings and turned the fortress into a castle. The two dominant buildings at the eastern and northern side of the courtyard were erected during the rule of Ottheinrich (1556–1559) and Friedrich IV (1583–1610). Under Friedrich V (1613–1619), the main building of the west side was erected, the so-called “English Building”. 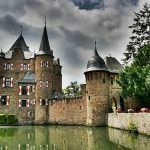 The castle and its garden were destroyed several times during the Thirty Years’ War and the Palatine War of Succession. As Prince Elector Karl Theodor tried to restore the castle, lightning struck in 1764, and ended all attempts at rebuilding. 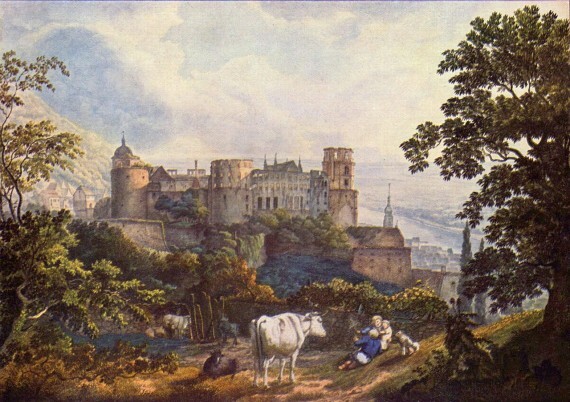 Later on, the castle was misused as a quarry; stones from the castle were taken to build new houses in Heidelberg. This was stopped in 1800 by Count Charles de Graimberg, who then began the process of preserving the castle. Although the interior is in Gothic style, the King’s Hall was not built until 1934. Today, the hall is used for festivities, e.g. dinner banquets, balls and theater performances. 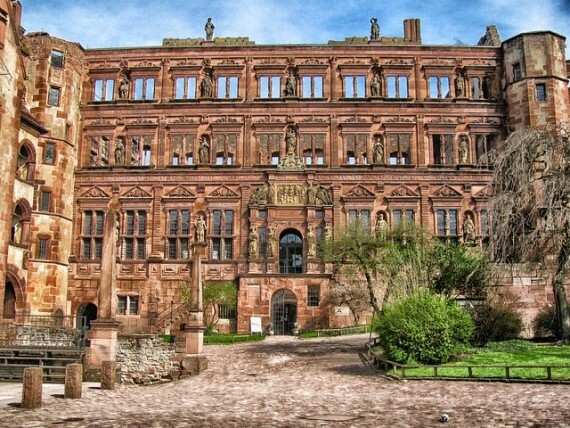 During the Heidelberg Castle Festival in the summer, the courtyard is the site of open air musicals, operas, theater performances, and classical concerts performed by the Heidelberg Philharmonics. Heidelberg is known for its institutions of higher education. 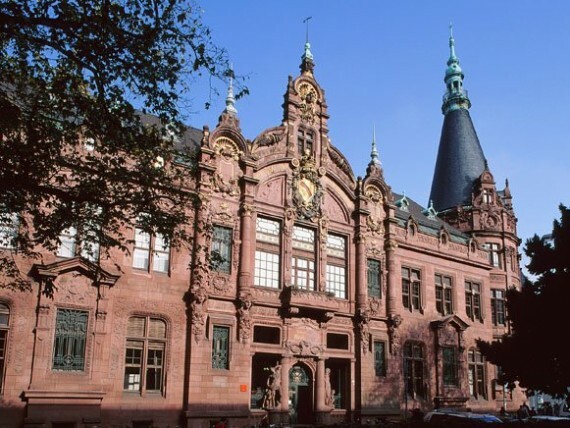 The most famous of those is Heidelberg University. Founded in 1386, it is one of Europe’s oldest institutions. 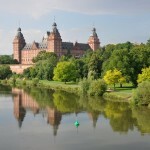 In fact, Heidelberg is the oldest university town of today’s Germany. 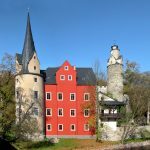 Among the prominent thinkers associated with the institution are Georg Wilhelm Friedrich Hegel, Karl Jaspers, Hans-Georg Gadamer, Jürgen Habermas, Karl-Otto Apel and Hannah Arendt. The campus is situated in two urban areas and several buildings. In numerous historical buildings in the old town there are the Faculties of the Humanities, the Social Science and the Faculty of Law. The school of applied sciences is located in the Science Tower in Wieblingen. The Faculties of Medicine and Natural Science are settled on the Neuenheimer Feld Campus. 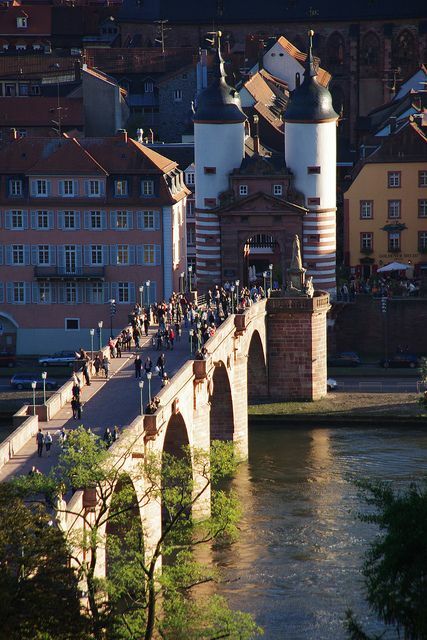 The Karl Theodor Bridge (German: Karl-Theodor-Brücke), commonly known as the Old Bridge (German: Alte Brücke), is a stone bridge in Heidelberg, crossing the Neckar River. It connects the Old City with the eastern part of the Neuenheim district of the city on the opposite bank. The current bridge, made of Neckar Valley Sandstone and the ninth built on the site, was constructed in 1788 by Elector Charles Theodore, and is one of the best-known landmarks and tourist destinations in Heidelberg. 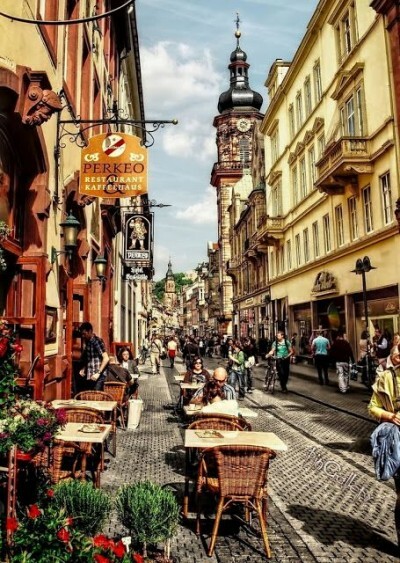 Heidelberg was the center of the epoch of Romantik (Romanticism) in Germany. There was a famous circle of poets, such as Joseph von Eichendorff, Johann Joseph von Görres, Ludwig Achim von Arnim, and Clemens Brentano. 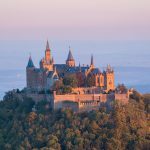 A relic of Romanticism is the Philosophers’ Walk (German: Philosophenweg), a scenic walking path on the nearby Heiligenberg, overlooking Heidelberg.